Facebook has a myriad of marketing features available to businesses whilst dynamic video re-targeting campaigns from YouTube is highly effective as well. A picture can paint a thousand words on Instagram whilst LinkedIn is a great place to begin, not to sales pitches but building connection. But, do you know that Facebook continues to dominate around the world? With over 2.23 billion users, 340 million Facebook subscribers are from Europe as of December 2017. And, it turns out that 59% of entrepreneurs use Facebook for advertising to create brand awareness and boost its business. 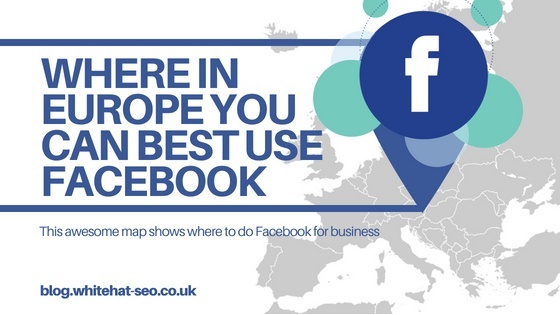 So, this awesome map can show you the Top 10 countries in Europe with most Facebook users. Using this data can be your ultimate guide in choosing a perfect social media marketing strategy for your online campaign. Using smartphones is one of the top reasons why most businesses dive into new marketing technique if they want to get noticed. And, it actually transformed us the way we market and shop. In the UK, Facebook is the most favoured social media platform with over 44 million users or 94.7% of the UK’s total population. So, if your competitor is using Facebook to reach out to customers and you are not, then, you are missing out. Even though the French population is actively discouraged from using social media, France lands second on the list with over 33 million users. Despite its huge number, most French companies prefer using Viadeo and Linkedin for its business growth. Planning to do social media marketing is a great way to reach consumers and end-customers. That is why Facebook is still the most popular social network in Germany. With over 31 million users, Facebook marketing is your best bet. But, don’t always expect to get the same results from your social media campaigns as in other markets. Note that Germans remain to be reluctant in using Facebook. The number of social media users in Italy has trebled over the last years. In 2017, Italy has recorded total Facebook users of over 30 million or half of its population. As a matter of fact, 59% of Italian SMEs say that they have increased sales because of Facebook. Taking this scenario into account, this only explains that Facebook is the right platform for marketing in Italy. In Spain, Facebook is not the most frequently used social network although 91% of its population have a Facebook Profile. Based on the data, WhatsApp is the most frequently accessed social media platform. But, this Spanish country still got a total Facebook user of over 23 million in 2017. Facebook is also the top social media network in Poland like any other countries are. It has over 14 million Facebook users. But, most of it are in the 16-24 age range. This statistics only show that marketers may have a hard time targeting the right audience. So, it would be ideal to use Nasza-Klasa if you want to reach out to consumers in Poland. Russia has a total population of more than 143 million. But, there are only around 13 million Facebook users. Unsurprisingly, the most preferred social media site by the Russians is the Vkontakte with over 90 million subscribers. Every country trends differ, and one way to learn more about a country’s platform is by studying its statistics. Just like in the Netherlands, it has nearly 10 million Facebook subscribers. But,the survey says that Dutch people prefer using WhatsApp for business purposes. Facebook accounts in Ukraine continue to surge every year after Russian’s Vkontakte was prohibited in the country. As of 2017, there were more than 9.5 million Ukrainians subscribed to Facebook. It looks like Ukrainian businesses should take advantage of using Facebook marketing. The last but not the least, Romania lands at number 10 as European countries with the most Facebook users by population. Data says that Facebook users in Romania nearly reached 10 million in 2017. This covers more than half of the total population of Romania. According to reports, 91% of the companies say that using social media like Facebook provides a competitive advantage. Also, 53% of respondents say that they generate sales opportunities using this social network. Independent retailers are booming in the UK whilst large businesses are struggling on the high street. So, how can you use Facebook to stand out from the crowd? Now that you know how Facebook is being used in every European country, all you need is to have an active presence. Look for Facebook platforms where you can find your potential audience and engage with them. This could be the answer to their queries. Or perhaps, they are just waiting for you to promote sales and special offers. So, stand and shout about it. Loyalty schemes are a great way to help you learn more about your customers. Let them sign up on your e-commerce platform via emails. Then, reward your customers with points for particular actions such as promoting your business in Facebook. These points can be converted to special discounts or freebies. Give customers a reason to make a repeat visit by providing fresh contents on your Facebook accounts. Let them know what’s in your store and show some exciting new products. This content need not be promotional in nature, it is one effective way to attract and delight them. Facebook is ideal for increasing lead generation and enhancing brand awareness. A little more than an hour of Facebook marketing work per day can result in wider exposure and greater revenue streams. But, keep in mind that the issue is not about whether or not a social media channel is effective. Remember, it is which social media platform you should be using. So, take the time analysing this data shown on the map. Choose the right Facebook marketing strategy to hit home with the right message every time.